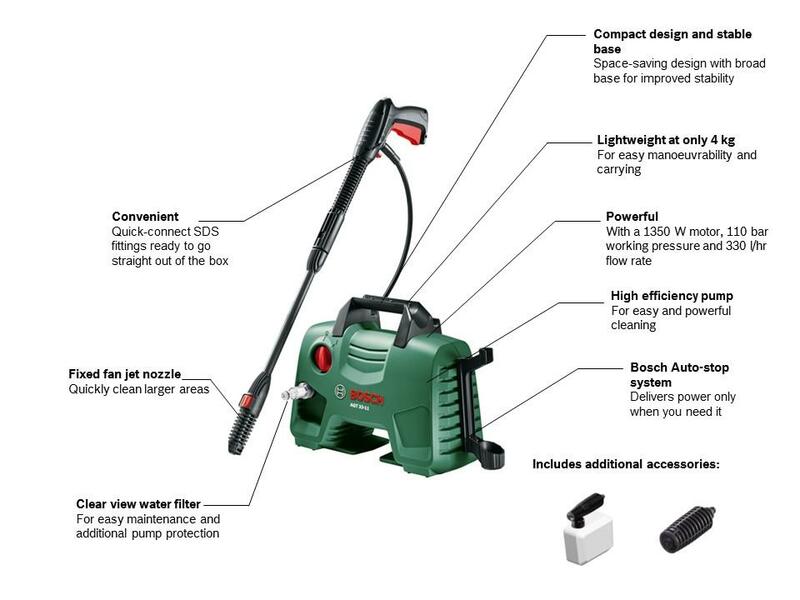 The Bosch AQT 33-11 pressure washer is compact and mobile, ideal for cleaning bikes, windows, patios and garden furniture. It has a 1300 W motor and a 330 L per hour water flow rate for quick, effective and effortless cleaning. It's quick-connect fittings and fixed handle mean it is ready to go straight out of the box, with no assembly required. The AQT 33-11 includes a fixed fan jet nozzle which allows you to quickly clean larger areas with ease, and a detergent nozzle for easy detergent application, ideal for cleaning small cars and bicycles. This product comes with a free 2 year guarantee. In order to extend the warranty from 2 to 3 years, please register your new tool with MyBosch. You can register your tool by visiting manufacturer's site MyBosch-Tools site within 28 days of purchase. At just 4 Kg, the AQT 33-11 is compact and lightweight making it easy to both manoeuvre and store away. Its fixed handle makes it easy to carry around your garden causing you minimal strain on your back and arms. The AQT 33-11 has a 1300 W motor and a maximum pressure of 110 bar making it ideal for everyday cleaning tasks. The 330 l/hour flow rate makes it quick and easy to clean the dirt from bikes, cars, patios and more. For efficiency and a longer product life the auto-stop system automatically stops the pump when not in use, delivering power only when you need it. 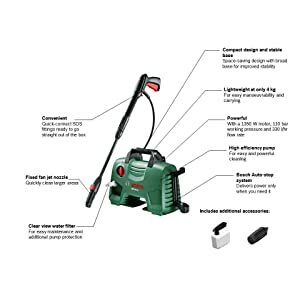 This pressure washer features a click and go system for a ready to use straight out of the box cleaning experience. The quick connect fittings mean that there is minimal assembly required – take it out of the packaging, set up the lance and hose and away you go. Be up and running in seconds. The AQT 33-11 comes with a fixed fan jet nozzle to quickly cover larger areas and a detergent nozzle for easy detergent application, but thanks to a wide range of available accessories, the AQT 33-11 is an all-in-one solution to any outdoor cleaning challenge. Also available are the 90 degree angled nozzle, suction nozzle, drain cleaner hose and patio cleaner.